The garden is slowly coming to life with the addition of plants provided by friends, some addition of my own and good old fashioned hard work. March has been a busy month with the arrival of the chickens, moving the poly tunnel and the addition of a large number of shrubs provided by friends. The progress from the blank canvas I started with last year can be see in the pictures below. The water Buttercup has buds on and is ready to flower and the Irises are showing steady growth. The pond now contains lots of frogs who are ….enjoying themselves. A broom has been added to this bed during March and should be soon adding colour. Three Alliums can be seen emerging in the middle of the bed. The Foxgloves are making steady progress at the back of the bed. There is now a row of Foxgloves down the left hand side of the garden stretching about 75 feet. The Lupin in the centre looks as if it will put on a good display this year. The only colour at the moment is from the Rip Van Winkle Daffodils. I planted these as per the instructions regarding the distance between them, but I now wish I had planted them all in one hole as I think they look lost. Whereas the ones adorning the side of the roads in large clumps look wonderful. The plant in the centre is now full of colour. (I still haven’t found out what it is, wish I had readers to help.) There Is a Poppy emerging on the left and a few bulbs but I need to look at how to brighten this border up at the start of the year. The Conifer on the right of this bed has been replaced with an Azalia and another broom tree. I have created two willow wigwams in this bed on which I intend to grow my Sweet Peas this year. 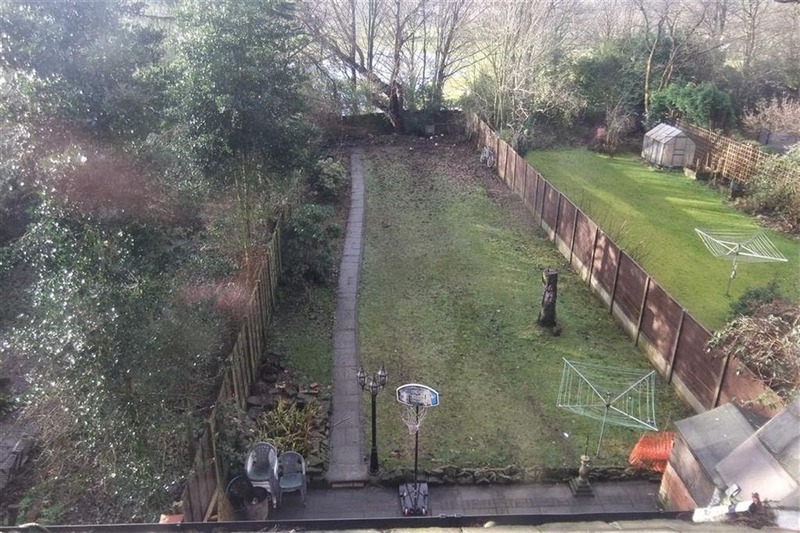 The tree in the centre of this bed has been removed. I finally accepted that it was dead and removed it. It is difficult to see but this has been replaced by a small apple tree. The rest of the border is coming to life There are two Azalias just coming into flower, one red one yellow. These will add early colour to this border in a couple of weeks. Weather permitting. There are is a Sedum which can be seen near the centre of the picture. The Foxgloves along the back have all been fed with fish blood and bone and I’m hoping for a superb display from these in a few months time. My chickens love the Kale even though it has now gone to seed. I have begun preparing the bed ready for the addition of organic matter. I have Spinach Beet, Runner Beans and Spring Cabbage growing in the house ready to add. I have planted Mizuna and Oriental Greens in trays as well as several pots of herbs. For the herbs I have used the supermarket ones which I believe are designed for eating almost straight away rather than growing on.. As these are intended for cut and use purposes they are very top heavy with the stems flopping over as soon as the wrapping is removed.. But I have found that re-potting them and only using the tops for the first month or so means I then have good plant for less cost than a garden center. My chicken house with extension. I, like many others, thought I could leave the run open and just clip the flight feathers of my birds. They are happy to stay in the run while I’m at the bottom of the garden but as soon as my backs turned the older one is out. On my return she looks at me as if to say. ‘I have no idea how I got out here’ and usually trots straight back in when the door is opened. A roof will soon be added to the run.